From Idaho Falls, take Highway 26 east past Swan Valley to Irwin. About 2 miles past Irwin, take a left onto Palisades Creek Rd. Follow the road for a mile or so until you reach the campground entrance. The equine (horse) trailhead is just across the bridge and to the right. There is plenty of parking (no fees for day use parking), restrooms, and running water. If however you continue straight instead of crossing the bridge you will be even closer (.2 miles) to the trailhead for hikers. There is a parking lot, restrooms and a nice bridge here. 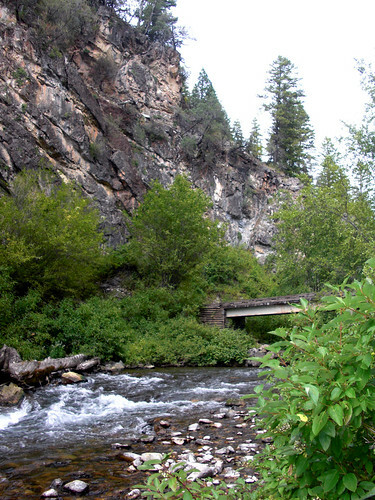 This trail is one of the more popular hiking spots in Southeast Idaho, and for good reason. The trail is well-formed and does not pose any serious incline along the first leg to the Lower Palisades Lake. The distance to the Lower Lake is 4.1 miles, and the Lower Lake is where most hikers stop. If you really want to take advantage of the wonderful area, I recommend you go on to the Upper Palisades Lake; the Upper Lake is much more spectacular and more wildlife can be seen on that portion of the trail (specifically, just north of the Lower Lake in the wetlands). The Upper Lake is another 2.6 miles from the Lower Lake. The trail continues to follow Palisades Creek for a little while, then breaks off to switchback up to the Upper Lake. The incline during the last mile before reaching the Upper Lake will give you a good workout, but it's not excruciatingly difficult. Once at the Upper Lake, you can stay left and follow the trail along the lake or you can head right and go down close to the water (many people go this way to fish). From the west end of the Upper Lake there's a sign that states that Waterfall Canyon is 2.5 miles up trail. Thanks to my GPS (Garmin eTrex Legend), I measured that distance to be 3.5 miles, so plan accordingly. To get to Waterfall Canyon, follow the trail on the north side of the Upper Lake for one mile, past an outhouse, then follow the sign at the fork which directs you to stay to the right. I lost the trail amongst the campgrounds there, so stay to the right and you should cross a stream before long. There are a couple spots to cross, so depending on how high the water is you may want to find the makeshift bridge a couple hundred feet upstream. Continue up the mountain - this is definitely the most difficult part of the trek to the waterfall. The trail is littered with felled timbers and eventually I ran into some snow that covered up the trail in some parts (June 21st, 2008). The incline is the steepest of the trek just past the Upper Lake, but levels out after about a mile and a half or so. After the stream crossing mentioned above, you don't see any running water until you get to the waterfall itself, so don't panic (unless you go later in the summer when the snowmelt is all but gone). The waterfall will be on your left and empties into a scenic pond/lake. The area is open and absolutely majestic. The trail does continue on, but I stopped at the first main waterfall. Both Palisades Lakes are very doable in a single day. Waterfall Canyon is more appropriate for one on horseback or for a backpacker (I wound up traveling about 21 miles on foot in the same day, and I can't say I recommend doing that to just anyone). Let me start by saying I prefer to go on hikes that I feel have a worth while payoff. I felt that this hike had small payoffs early. With the trail following the creek, many nice little waterfalls, several bridge crossings, and the nice rocks and cliffs in the canyon keep you interested. Another payoff was the raspberries we discovered right on the trail. The lower lake itself, although relatively small also met my payoff expectations. It was picturesque and there were 3 moose feeding and watering in the lake the day we were there. The payoff would still have been worth it without the moose, that was just an added bonus. We hiked this toward the end of August 2010. This hike was described to me as a moderate hike. I would agree with this assessment. My 6 year old daughter and 7 year old son were able to complete the hike, though the going was a little slow with them. We completed the 8.5 mile hike in 6 hours including 1 hour of enjoying the views at the lake. Due to the moose on the lake the day we hiked, I opted not to fish the lake. I did try my luck on the way back down in the creek and did catch a little fish with a Panther Martin spinner. It was enjoyable to follow the creek for most of the hike and the bridges are very nicely maintained. Although theres a few wet spots, you can easily keep your feet dry the entire hike. The creek provides ample opportunities for water filtration. I would love to hike to the Upper Palisades Lake someday, but that would be a very full day with my teenage children, or a backpacking trip to the lower lake with an overnight camp and an early start the next day to the upper lake, break camp and back down again. I would recommend this hike to others and plan to add it to my list of great hikes and will hike it again. There is an established campground near the trailhead and a great spot to camp near the Lower Lake. There is also a large camping area past the Upper Lake that has an outhouse nearby. See hiking description for other details. See hiking description for details. Palisades trail has some very well maintained bridges allowing you to keep your feet dry for the duration of the hike.